Turn your iPad into the ultimate mobile guitar and bass multi-effect processor! Use the AmpliTube iRig interface adapter (www.amplitube.com/irig) to connect your guitar to your iPad and you are ready to rock! Jam anytime, anywhere with world class guitar and bass tones right in the palm of your hand. AmpliTube for iPad gives you incredible ultra-realistic tones and modeling accuracy in a convenient and mobile app, from the leader in gear modeling software for professional recording studios. 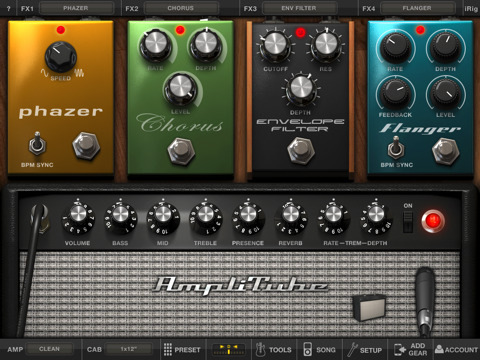 With AmpliTube for iPad, you’ll have an entire guitar/bass rig at your fingertips, comprised of 4 simultaneous stompbox effects, an amp-head plus cabinet and a microphone. You will be able to choose between 5 amps (Clean, Crunch, Lead, Metal, Bass) with full controls, 11 stompbox effects (Delay, Fuzz, Overdrive, Wah, Envelope Filter, Chorus, Flanger, Phazer, Octave, Noise Filter + Distortion once registered), 5 speaker cabinets and 2 microphones (dynamic and condenser). Plus, AmpliTube for iPad features a chromatic digital tuner and a metronome and you can also import and play along with your own songs or backing tracks with real time effects, and create, save and recall up to 36 presets on the fly! Visit www.amplitube.com/irig for more information, audio and video demo about the app and on how to connect your guitar to your iPad with iRig interface adapter.